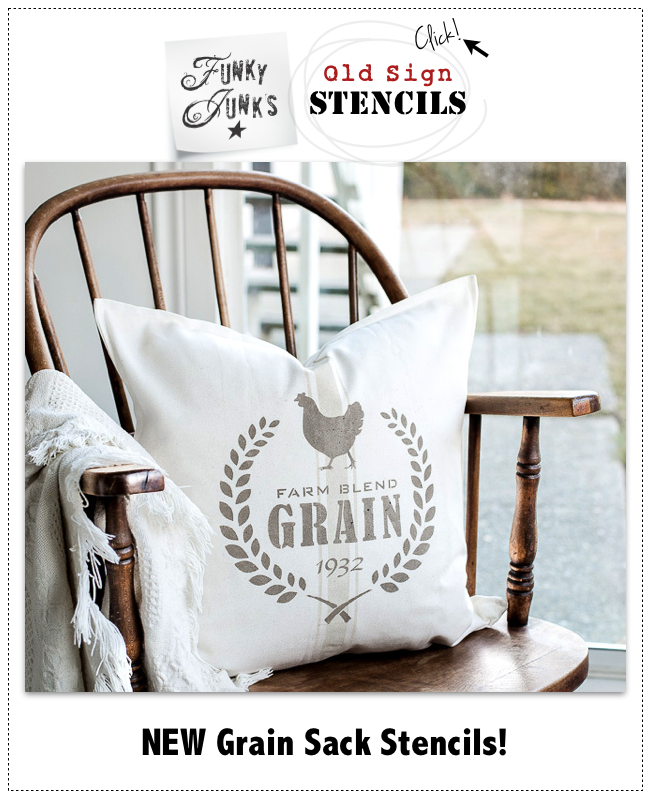 New junky updates in one sweet newsletter – join in! 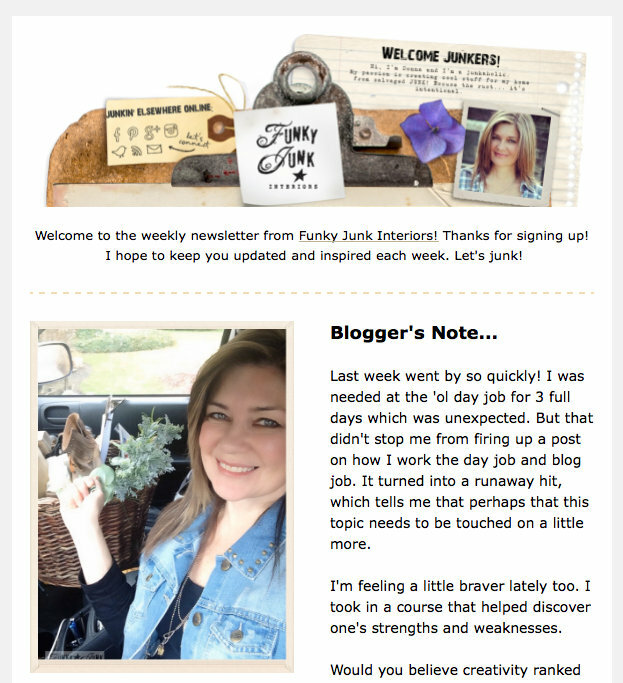 If you subscribe to Funky Junk’s individual blog posts via email, you may have noticed the thumbnail pictures are a little small. VERY small. Or maybe you don’t subscribe to the posts at all. Maybe you’re still searching up the blog direct. Or through a reader. Or attempting to nail a new hit and miss Facebook or social media prompt. Well… now there is a much more colourful, fun version, that will come right to you direct so there’s no more searching! 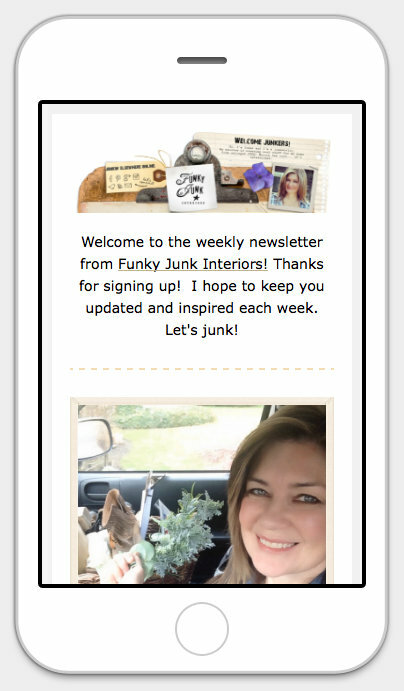 Funky Junk’s new junky updates in one sweet newsletter – join in! I’ve been wanting to do this for YEARS. I just haven’t taken the time to learn how to build one… until this weekend. Enough was enough. This is a year of new and this one landed on top of the list. … new stuff I haven’t thrown out to social media yet. You’ll see it here first! Oh man… the sky’s the limit now. Events, travel, stuff for sale (that’s on my list too!) and… well, anything! The newsletter also condenses down to a mobile version which is pretty sweet! The newsletter will be a regular once a week thing for each Monday morning. Since I have one ready to roll and it’s already Monday night, I’ll send this first one out Wednesday morning so you have a chance to check it out! Once I get the swing of it all, I have a few other fun ideas and ways of saying THANK-YOU for following along this wild junk ride with some freebies for all and giveaways for some. Fun! As with anything new, this is on trial. Once a week may be too frequent, but I’ll keep you in the loop with what transpires. This is what the sign up screen will look like. So… wanna try it out? 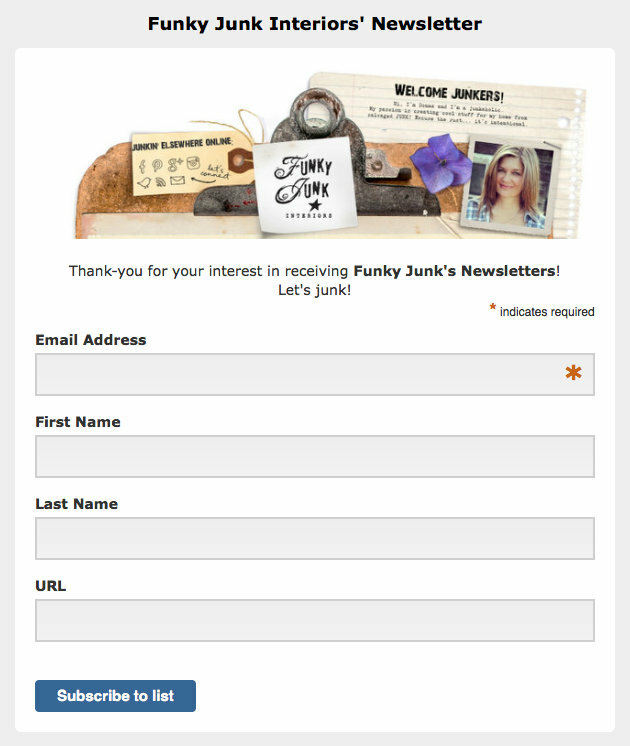 And of course, subscribing to Funky Junk via each individual blog post is still available to you too so you get everything right away. 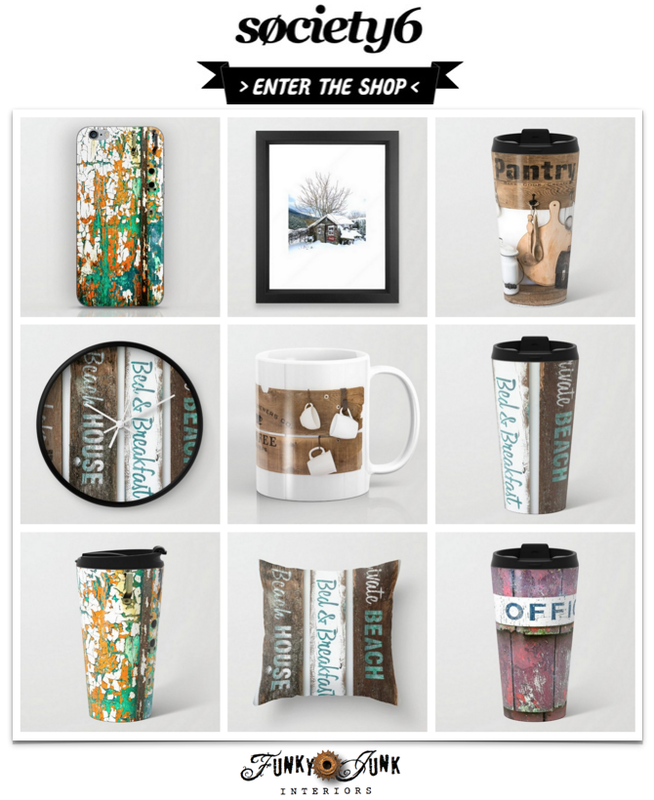 Just enter your email in the widget below this blog post or on the sidebar and you’re done! Count me in, too! I’m excited for this! Can’t wait to see your new newsletter. How can I get the rest of the article under Blogger’s Note? I think I signed up for the newsletter but am not certain I did it correctly. 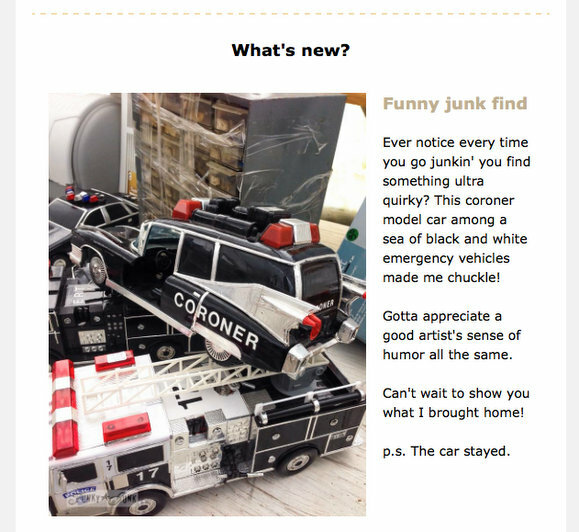 Just signed up for your fun newsletter!…and that coroner’s car is certainly “quirky”! 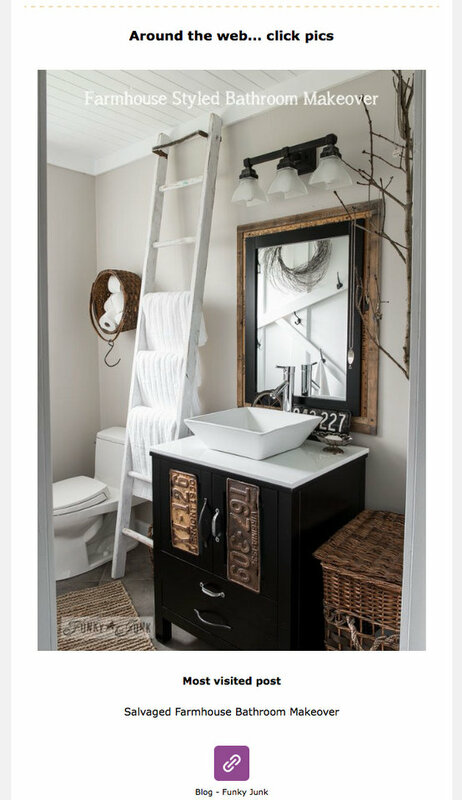 !…and no wonder your bathroom makeover was the most viewed as it is so amazing!! tried to subscribe as directed but no luck? bug?? It;s not letting me type on the form either. Can you sign me up? Please? It won’t let me sign up. Can you please add me? Thank you! Thanks Donna; I just came across your website via Hooked on Houses and I am trying to take your advice with respect to life and perspective. I love your ideas and I think I have a project that would lend itself very nicely to your pallet guidelines. Now I just need to convince myself I can do it and find some wood. Keep up the great work. Got to love a woman who is living life the way she wants to despite hurdles and setbacks. Very inspiring. I am having trouble sighning up for your news letter. By the way, love your outlook on life and God bless you. Nice newsletter, easy to read format, super pictures and just too cute kitties. 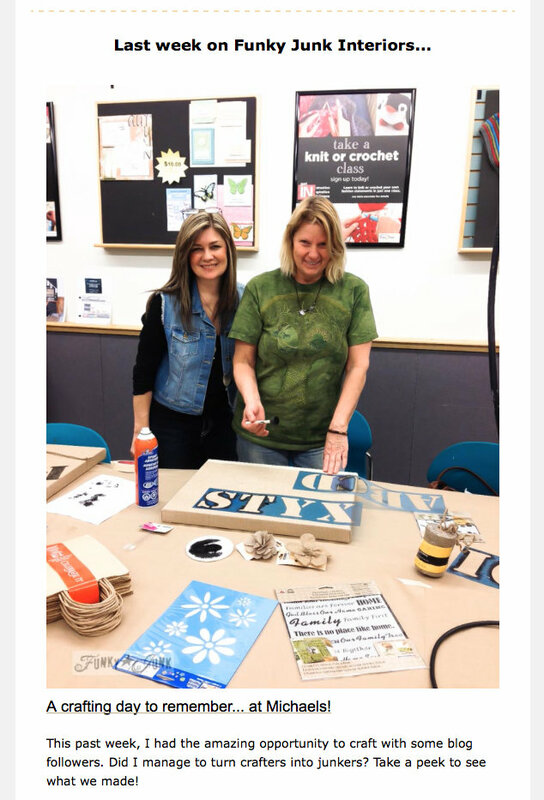 Donna – I love the newsletter!! So brave of you!! You are such an inspiration to me to step outside the box. Blessing to you! 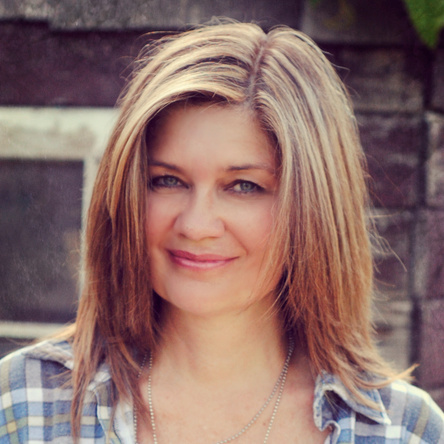 Congratualtions on the new project, Donna! It look wonderful. I have a dumb question for you, though…what’s the differnce between blof posts and a newsletter? The post above pretty much nails what’s involved. Hope that helps! To continue… not everyone subscribes via email to blog posts. If you don’t, this is a way to get EVERYTHING to your inbox so you don’t have to hunt for it. If you do subscribe to blog posts via email, the newsletter is much more colourful and fun to look at than an RSS feed. And will have way more info. I can’t seem to make the sign up work. I’d like to sign up for the newsletter. Got it – I figured it out. Looking forward to it! Got a real bug here or something. Won’t let me sign up. Please put me on the list. Don’t want to miss a thing. Will you please add me too! I don’t want to miss a thing and it’s not letting me sign up! I love your blog! It’s so encouraging! 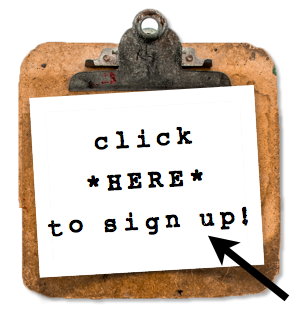 Donna, I’d love to sign up for your newsletter, but the sign up form is wonky! You have had this up since February? Where have I been? Just noticed and signed up. This will be great. So looking forward to the news letter. Great idea. Hi Alice! I just added you to the list, it didn’t appear you were on it. You’ll receive a newsletter every Monday, 3am Pacific. Thank-you! I love your work. Thank you.